Society has placed a great deal of emphasis on youth. This is not wrong in and of itself. It is especially the right thing to do if the young are seen as those who will shoulder the responsibility of building upon the foundation which has been laid for them, and leading us toward the next chapter of creation history. However, if we are obsessed with youth to the detriment of elders, then we have failed miserably in understanding this important commandment of God. There is an adage that says, “Don’t forget the bridge that brought you over,” and the bridge in this case are our elders, seniors and grandparents. I was born to a fifteen year old single mother. However, to my mother’s immediate benefit and my life-long gain, I was brought home to a room that had been prepared for my mother and me, in the home of Caledonia Easter Lonnibell Hampton Lewis Yancy, affectionately known as Big Mama. Big Mama was my great grandmother, and looking back over my life, I now am certain that she is the person who has made the biggest impact on every aspect of my life. Her home-spun wisdom and admonitions still resonate as I seek to rear my own children. I cannot forget her saying, “Don’t mess around and shorten your days.” Which was her way of keeping Exodus 20:12 ever before me. Or, “Don’t put a ten dollar hat on a ten cents head.” In other words, what is in your head will always be more important that what you put on your head. I have thought about big mama during this riveting election season. Critical questions are being raised concerning the state of the Union. Is it healthy? What does the future hold for us? In order to answer these questions, I do not look to the military pundits even if they do understand what is needed to keep us safe in a terrorist laden age. I do not look to those who will hold offices, regardless of their political affiliation. I do not even look to the economic analysts, although they may be keenly proficient in financial forecasting. In assessing the state of our union, I remember Big Mama and I first look to see how we are treating our elders. If the elderly are being honored, the union is headed in the right direction. The principle of filial respect, love, and reverence for elders is such a foundational cultural principle that it has found a place in every moral code. Confucius based his moral system wholly upon the principle of parental authority; for the Romans it may have been the underpinning of their political institutions. In the Decalogue, the position of this fifth commandment, at the head of the duties of the Children of Israel towards others, marks its importance, which is further shown by it also being “the first commandment with promise” (Ephesians 6:2). The Fifth Commandment is pivotal to the rest of the commandments. Yahweh understood that his laws would be transferred by the Israelites from generation to generation through elders teaching them to children. In order for children to be proper receptacles of holy teachings, they would have to respect those who were their teachers. Just as the laws of Jewish culture could not be passed on unless children respected their parents and elders enough to learn and heed their laws and customs, our faith will not be passed from generation to generation unless we respect our elders enough to learn and heed their faith teachings. We will truly show how much we honor our elders, by how we carry forth the faith and moral code they have bequeath to us. Although the transmission of culture and religion begins with children, this is not a commandment aimed at little children. No, this is a commandment to those who have matured and are now in position to heed and live out the commandments of God. Most modern biblical commentators generally assume that the promise of long life for honoring one’s father and mother was not personal, but national—the nation’s days would be made longer. This sentiment resonates with me and bears out my earlier contention that one can assess the state of a Union/a nation by how it treats its elders. 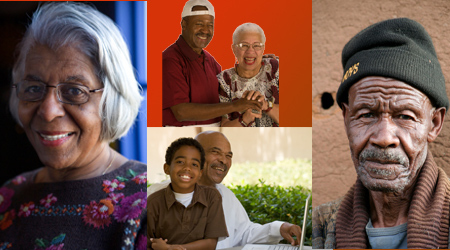 For much of our history as African Americans, seniors have been considered one of our greatest assets. Not only are they great repositories of wisdom and experience, but they were the teachers of the faith. It was on their knees that we learned to love God, to love self, and to love community. Honor our elders, “that our days may be long upon the land.” Interestingly, God offers this as a way to lengthen our days on the land. Our days will increase on the land that God has given us to work and on which to live. Honor your parents, elders, grandparents, great grandparents that thy (yours, the community’s, the nation’s) days may be long. Instead we are worried that aging Baby Boomers will become a burden on our society and empty the pensions and savings coffers of younger persons. The choice is ours we can do as God commanded and prosper or adopt a self-centered posture that causes us to lose sight of our elders and lose our way. If God allows, we too will become well-worn travelers and we will desire that those who are younger honor our graying locks, our wrinkled hands, and our well-lined brows. But this is not the reason we now give honor to those on whose shoulders we stand. We honor them and the path that they have cleared for us, because we are holding fast to the first commandment of God which also comes with a promise. Smells: Aromas of pies and vegetables baked by a granddaughter using grandmother’s recipe. If you are an adult with living parents, honor them by discussing while they are fit and healthy how they would like to live out their years of retirement. Purchase insurances while they are healthy. If you ultimately have to make decisions regarding nursing homes, medical procedures and more, always ask: Will the action I want to take honor the life of this person? If your parents and grandparents are deceased be sure that the youngest members of your family are told about the departed. Take the young with you when you go to place flowers on graves. Tell stories about the deceased and how they impacted your life. Honor your heritage. During family reunions and other celebrations, honor your elders and allow younger family members to participate. You can do this by naming scholarships in honor of special elders and or by giving a donation in their name to churches or causes they supported while alive or in the case of living elders, still support, etc. Childs, Brevard S. The Book of Exodus: A Critical Theological Commentary. Philadelphia, PA: Westminster Press, 1974. pp. 418-19.